Overview: Designed to deliver a fast and efficient cruising experience, the yacht is a different approach to traditional superyacht design, more so resembling a sleek battleship than a cruising vessel. 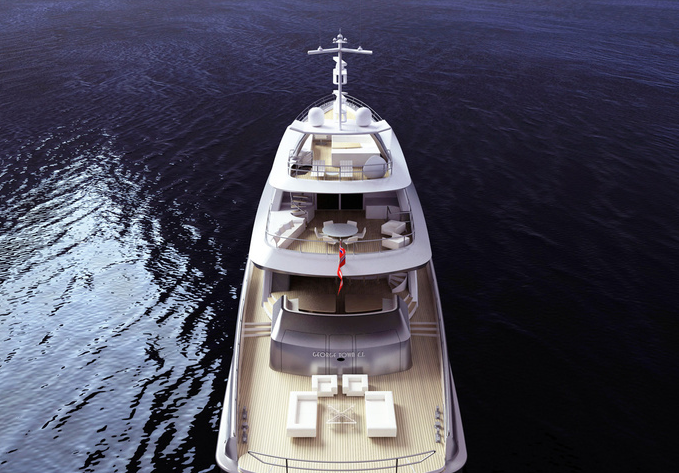 The superyacht concept displays spacious and luxurious areas throughout, including its expansive windows that reach full length to make the most of natural light. In the foredeck an owner can find a Jacuzzi big enough for eight people with large sunpad areas,and generous spaces for dining or entertaining. 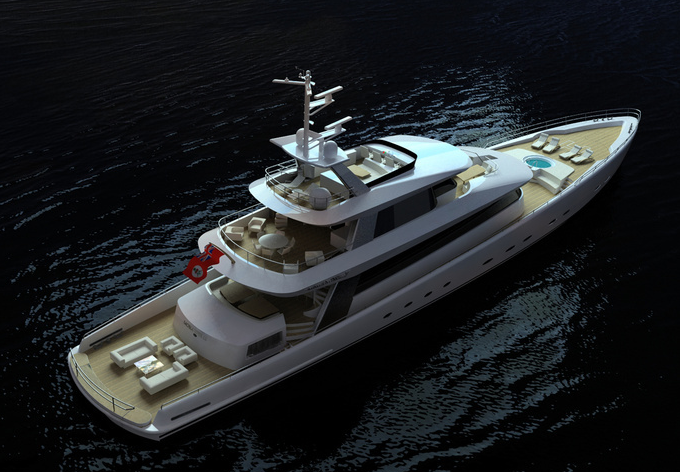 Further forward, there is a touch and go helipad, and full beam tender garage that can swallow a pair of 25′ Iboats. The aft cockpit can be converted into a beach club, featuring sofas and loungers, a staircase down into the water, with the passerelle doubling as a diving board. 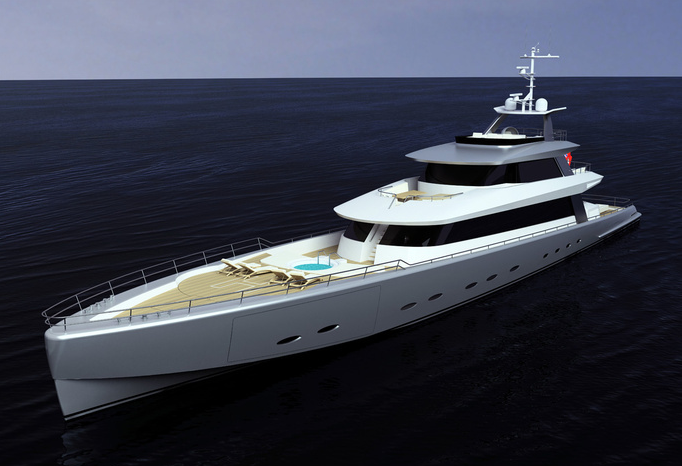 The interior will offer an owner’s duplex suite, with private main deck reception and sitting room. 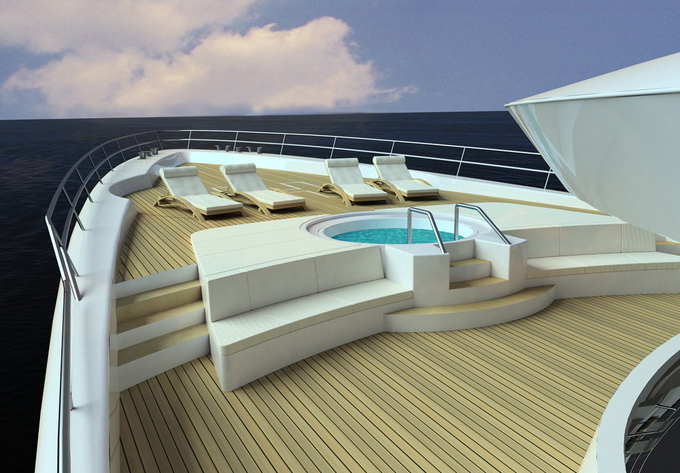 Further accommodation comprises two VIP suites, two twin suites and space for 8 crew. The Sportfisherman also offers stability and a low fuel consumption rate for something so fast and large. With a pair of 3000hp 16 cylinder diesels she will comfortably reach speeds in the high twenties, with an economical cruising speed a shade under 20 knots. An optional centerline turbine installation will allow sprint speeds of 45 knots, which would make the Sportfisherman the fastest private vessel on the water of this size.